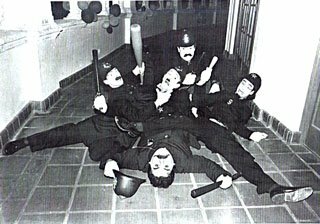 Rawdon, Images of Laurel & Hardy's eponymous "Keystone Cops" undoubtedly spring to one's mind. But more interesting is the question of which Keystone Cops? Is it the bumbling idiots (linked above) or is it more nefariously neglectful seen here, perhaps cynically idiotic in a bungled attempt to insure London's primacy?